Imagine my surprise to find my painting Quickened Toward All Celestial Things has been given a street view exhibition space at Portland 5! Thank you @SirenNation for an awesome opening reception tonight. My adult life I’ve had an unreasonable fear of being without a book to read. The anxiety is triggered when I travel, particularly by air. I trace its beginning to childhood when, on a family vacation to visit my grandparents in Italy, our plane was delayed in Germany for hours due to bad weather. Eventually, all passengers were shuttled by bus from Frankfurt to an airport in Stuttgart, continuing our flight to Rome. I was in the fifth grade, stranded in a foreign airport with nothing to occupy me for twelve hours. My personal Hell was exceeded only by my parents’: they had to manage my boredom along with my six year-old brother’s, and toddler sister’s, also stranded. Fun times. From then on, I travel with whatever book I’m reading, and if nearing its end, at least one other book, or more, depending on the planned length of stay. I know books are sold at airports, but I’m unwilling to take a chance on their selection. Problematically, my books take up space, and add weight to my luggage, interfering with my desire to travel light. The invention of digital readers changed this. I live near one of the best independently owned book stores in America, and I apologize to all small, independent book store owners, but the ability to download books to a slim, lightweight device, and buy more books from virtually anywhere I travel was a game-changer, until last year. Last year, the hospital where I work installed a Tiny Lending Library in its Healing Garden. Besides the satisfaction derived from the printed page of a book, the experience of handling a used book left by someone wanting to share it provides a connection to the neighborhood, and the people who live there. At work, I stop to see what’s on the shelves in the Tiny Lending Library if it’s not already being examined by staff or neighbors. The selection changes often. So far, I’ve borrowed six books, and left twice as many. Once again, there’s a stack of unread books on my nightstand. I carry the one I’m reading with me to work, in case I have time on my lunch break to read a page or two. Eventually, it will take its place in the Tiny Lending Library. I wonder how many of the books from the Tiny Lending Library make their way into hospital rooms, carried there by family or friends visiting a patient who is stranded by illness or injury, and worried about not having enough books to read? Preparing materials for tumor conferences is part of my role as an oncology nurse navigator. It involves, among other responsibilities, reviewing the cases, printing copies of the agenda for the attendees, managing the sign-in rosters, and providing updated lists of available clinical trials. It also requires powering on the projector, the screen, and setting up the digital microscope necessary for the pathologist and radiologist to project slides of the tumor cells, and the MRI or Cat can images on the large screen for discussion. Suddenly, and unexpectedly, I’ve become Audio/Video Girl. Other nurses of my generation will appreciate the humor in this. Does any one remember watching film strips and movies in grade school classrooms? Did your hand shoot up when the teacher asked for volunteers to set up and run the projector? Mine did, but it was always a boy who was chosen. Eventually, I stopped raising my hand. Years later when I became a pediatric intensive care nurse, I discovered an aptitude for tubes and wires, or rather I learned to get one fast. The ability to troubleshoot a ventilator until a respiratory therapist could fix it became handy too. I realized the level of skill I’d developed when as a single mom I set up my stereo system (you who grew up with bluetooth streaming have no idea how easy you have it), and a desk top computer with printer/fax using a dial-up modem. In case you are to young to know, we could not use our computers and phones at the time in those days. Learning to set up the electronic equipment for tumor conference was a lot like how I learned almost everything as a nurse: someone showed me how to do it once, and then I was on my own. However, as mentioned, I have developed an aptitude for technology: during the demonstration I snapped pictures of the wire connections with my phone, creating a visual reference guide to use later. I was anxious the first time I set up by myself. While lifting the digital microscope which I imagine costs a hefty portion of my annual salary from its cart to the conference table, I distracted myself from my fear of dropping it by imagining twenty doctors staring at me because it didn’t work. Tumor conference would be a disaster if I failed.. The microscope and projector worked. Relieved, I glanced at the doctors, men and women, seated around the table. Some of the male faces resembled grown up versions of the boys in grade school my teachers chose to run the projectors. Some of them probably drive cars electronically more complex than the audio video equipment I had just set up. To be clear, I am treated respectfully as part of the multidisciplinary team at tumor conference. I’m proud to be part of this valuable service offered to our patients. I am happy with my life choices. However, I wonder what might be different if girls were chosen equally with boys to run the projectors when I was young? Starting a new job has kept me super busy the past three months, and carves into the time I have to paint, draw, and write. So, I’m really grateful for the two felted knitting kits I received as Christmas gifts last year from my mother-in-law. To be honest, I probably wouldn’t have picked these for myself, but that’s what’s so great about a gift: you don’t always know it’s what you need or want until you use it. Turns out, making these little bags has filled my need for creativity, without having to do anything except follow directions. 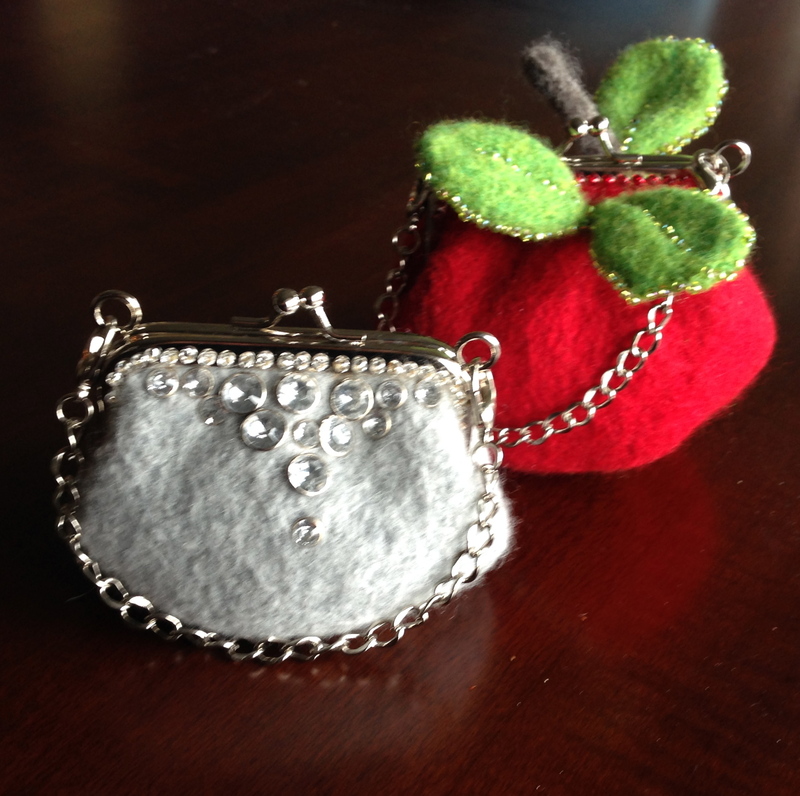 They were actually quite fun to make, although sewing all of those teeny-tiny beads to the apple bag was a little challenging at times. Anyway, they’re pretty cute. Nora J. Bellows designed the kits, found at nonipatterns.com. 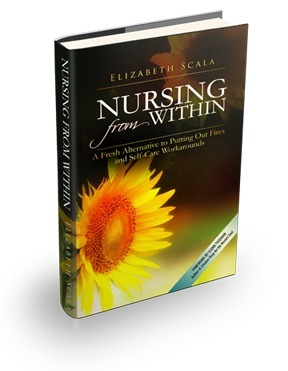 In her book, Nursing From Within, a Fresh Approach to Putting Out Fires and Self Care Work Arounds, Elizabeth Scala, MSN, MBA, RN takes on the chronic dissatisfaction most nurses experience at some juncture in their career. With change rapidly dominating the landscape of health care delivery, nurses are stretched to the breaking point in their ability to provide safe, patient centered care. It is possible that nursing, the entire profession as we know it today, is stuck. Bogged down from the energy that is created with the funnel. Looking left and right, turning around or glancing above us-who do we see? What do we hear? Where do we go for answers? We hear the same things, talk about the same things, and live the same things. While nursing has come a very long way in terms of scientific skills and critical thinking, can we say the same thing for our own personal and professional evolvement as a whole? Are we developing in a way that will help us to thrive and move forward as a group? Or is the mindset of ‘this is how it’s always been done?’ keeping us stuck in the funnel of nursing limitation? In a conversational voice, Scala uses stories from her personal experiences to illustrate how she changed from a nurse on the brink of burnout into one with an expanded viewpoint of where an open mind and change from within can lead. The creative career solution she chose at the book’s ending surprised me. It validates the versatility of a nursing license, but I’m not sure it answers the question at the heart of the book’s premise. However, this does not take away from the truth of Scala’s observations, or the value of the tools she presents for self care. Scala’s openness and authenticity shine through. Her topic is important, demanding recognition and discussion among nurses. I found much of what she wrote inspirational. Drawing From Life is my latest post for Off the Charts, the blog of the American Journal of Nursing. It posted yesterday. Often the lines between art and nursing easily blur, like soft charcoal lines smudged on paper. You might want to check it out, or leave a comment. The Adventures of Nurse Niki now posts new episodes on Mondays, instead of Thursdays. Be sure to read week’s episode, Moving On.. Call Light Magazine: Looking for Real Nurse Models, The Adventures of Nurse Niki Chapter 30, posted Thursday. Niki and her coworkers answer the call for Real Nurse Models needed for a lifestyle magazine photo shoot. A little out there? Maybe, but real nurses don’t live in hospitals, do they? NPR Syndrome is the name of my February post for Off the Charts, the blog of the American Journal of Nursing. It discusses the difficulty nurses have letting go of our work once we leave the hospital, due to information overload in our digital age. The Adventures of Nurse Niki has a new format. The homepage is now static with Chapter One, like a book. The latest chapters are found by clicking the chapter number above the blog’s header, or from the Chapters drop down box at the upper left corner. Each chapters now has a brief description. The changes are in response to suggestions by faithful readers (you know who you are) and are intended to make The Adventures of Nurse Niki friendly to first-time readers, while keeping navigation easy for those following the story from its beginning. Julianna has embarked on something special for the nursing community. The Adventures Of Nurse Niki is one of the most intelligent perspectives of life as a nurse. These are the experiences of a “real nurse” if you ask me. Nurse Niki is a smart and dynamic character who works night shift in the PICU at a California hospital. A good television show or fiction novel could certainly draw out the sexiness of working in the ICU, but with Niki’s story we quickly discover that this dynamic character is also struggling to cope with life at the bedside, and as a mother and wife. Hidden within each chapter the discovery is that Nurse Niki is in fact you. She’s me. Well that is of course if I was a woman. You can interact with Niki on The Adventures of Nurse Niki’s Facebook page. Please don’t forget to “Like” it too. Show Niki some love! Thank YOU!! to the readers following The Adventures of Nurse Niki, the retweets of @NurseNikiAdven (Hashtag #NurseNiki) and those who Like Nurse Niki’s Facebook Fan Page. The support is very much appreciated! JParadisiRN readers may know that last year I began writing a monthly blog post for Off the Charts, the blog of the American Journal of Nursing. The latest post, Voice of Dissension: When Nurse Teamwork and Patient Safety Diverge published yesterday. I think it’s worth a read, and even a comment, if I do say so myself. For readers unfamiliar with JParadisiRN, I also made the drawing that accompanies the piece. 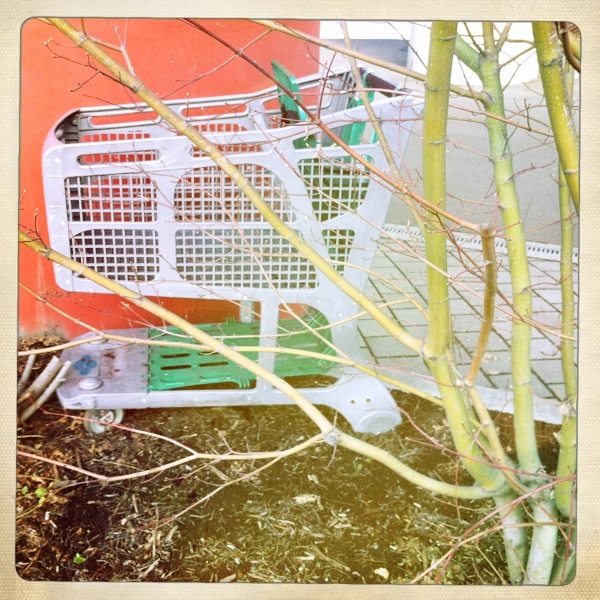 Buy Yourself Another One, The Adventures of Nurse Niki Chapter 27, posted today. It’s about the eating habits of nightshift nurses and that special relationship between doctors and nurses. 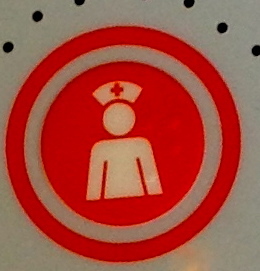 The Adventures of Nurse Niki is a work of serial fiction. The blog is formatted so the most recent episodes appear at the top. New readers not wanting spoilers of The Adventures of Nurse Niki may begin at Chapter 1 and scroll up from there. Chapters are archived by month (click on the lined square icon on the home page). New chapters post weekly on Thursdays. It’s the weekend before Thanksgiving, and I’m grocery shopping. Pushing a cart through throngs of people looking for that special can of yams, I wish I’d pinned a sign reading, “Don’t follow, Makes frequent stops,” to my rear, so people might stop running into me. Surprisingly, most of the shoppers are in good moods. I hear the words, “Excuse me,” “After you,” over and over. Only the very young adults, shopping for holiday meal preparations for the first time, I presume, express out loud their bewilderment at the crowds. Suddenly, their attention to space and time is required. This means they have to get out of the way while text messaging, instead of stopping abruptly in the middle of an aisle where more seasoned shoppers will trample them. I’m sure she’s a nurse. *This post was originally published on JParadisiRN in November 2012. The Adventures of Nurse Niki Chapter 21 is posted! In this week’s episode, Simon’s Turn, Niki experiences a life-changing moment. You can interact with Niki on The Adventures of Nurse Niki’s Facebook page. Please don’t forget to “Like” it too. Show Niki some love! Thank YOU!! to the readers following The Adventures of Nurse Niki, the retweets of @NurseNikiAdven (Hashtag #NurseNiki) and those who not only Like Nurse Niki’s Facebook Fan Page. The support is very much appreciated!